Ha ha! Very funny. Love the cartoon. You have such witty / humorous / creative posts. Thanks 🙂 🙂 Blessings. I think you should have, too…! 🙂 At least you should keep writing about it. I’ve never been uplifted more by an article on the weather. Made my day! Haha I think you’re right. 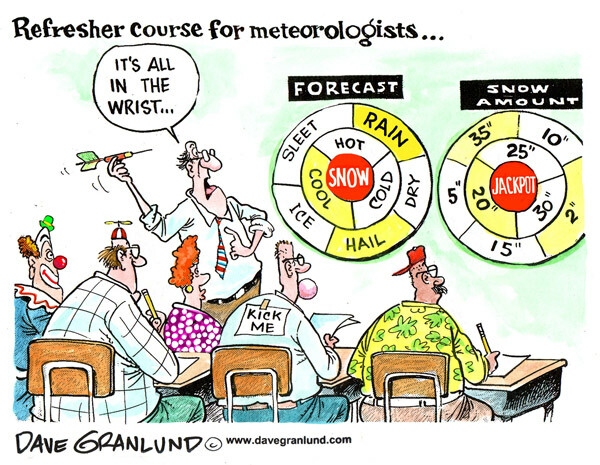 So, were you aware meteorology was my major in college? Dead serious, I even have the degree and everything! Jobs weren’t to be had around the time I graduated though, and by that I mean real meteorology jobs. Weathermen on TV are more broadcasters than they are meteorologists… at least the most prominent ones are. You have to learn how to spin every potential snow event into an impending apocalypse and break in to everyone’s favorite shows whenever there might be a storm maybe passing through kinda…. I bet you would’ve been top of your class if only you’d avoided the TV weather guys like the plague! I’ve never heard a meteorologist predict meteors though. Here in Cali, anytime the weather is unpredictable, people call it “earthquake weather.” Because it’s obvi that rain on a sunny summer’s day means a pending platetectonic shift. A tornado? Wow…must mean a 10.0 on the Richter scale! I’m not sure why they even bother with a weather forecast out here. It really does seem to be as accurate as randomly throwing darts and determining the forecast solely based on wherever they land.